20th century workings. 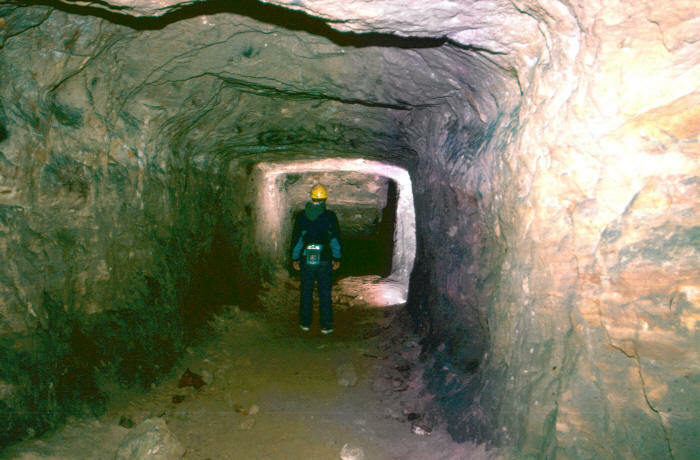 The 20th century miners did not carry out a great deal of work at Alderley Edge but what they did was distinctive because of its square shape resulting from the use of high explosives such as dynamite. The shotholes were made by a mechanical drill and so are usually circular in cross-section. 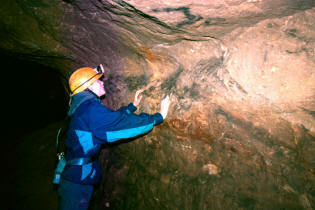 Evidence of the use of high explosives, presumed to be twentieth century work, can be found in West Mine, Wood Mine and Engine Vein. (Left) 20th century shotholes. Holes drilled and blasted in the 20th century cannot really be seen in section in the same way as 19th century holes. This is because the high explosive used shatters all the rock around the drill hole leaving a smooth hollow as seen in the centre of this picture.